Do you feel lost when sifting through wind direction data that is listed in degrees? For example, can you picture in your mind what direction 195 degrees is? Would it be easier if your data logger could put your data in compass directions instead? In this article, I’ll share with you an easy method for converting your wind direction data from degrees to compass directions using the CRBasic programming language. If you’re like me, compass directions (north, south, east, and west) are easier to understand than degrees. For example, if someone asks me for driving directions, I don’t say, “Travel five blocks on a 270 degree heading.” It’s easier for me, and the lost driver, if I say instead, “Go west for five blocks." In terms of wind direction, it is both fortunate and unfortunate that data loggers don’t “think” like us humans do. Fortunately, our data loggers scan our sensors, convert the measurements to electrical signals, and store the data in degrees, which are more precise than compass directions. Unfortunately, we may struggle with making sense out of wind direction data that is in degrees. To make sense out of wind direction data that is in degrees, let’s get started in our conversion process. To convert degrees to compass directions, I first divide the compass into 16 sectors of 22.5 degrees each. The sectors are like slices of pie, centered on the compass points. Tip: If you would like to use eight sectors instead of 16, with a shorter lookup table, divide by 45 degrees instead of 22.5 degrees. Now we need to convert wind direction to integer values that correspond with the 17 index values within our array. To limit wind direction to 360 degrees, we need to perform a modulo operation to find the remainder after dividing the total degrees by 360. This can be written as 405 MOD 360 = 45. In this example, the remainder of 45 degrees is what needs to be converted to a compass direction. Note: Although this step isn’t necessary with most sensors, it won’t cause any problems if you include it in your programs. So, our remainder of 45 degrees converts to a direction of northeast. Putting all of the pieces together, we get the following data logger program. Just add your measurements and data tables. CompassDir = Sector(Round((WindDir MOD 360)/ 22.5,0)+1) 'Rounds the wind direction out into 17 sectors. Sectors 1 and 17 are both N.
In this article, I hope I helped you find your way to better understand, use, and share your wind direction data using some CRBasic programming code. If you have any of our RTMC software products, this software is able to take your wind direction data and directly convert the degrees into a compass display. 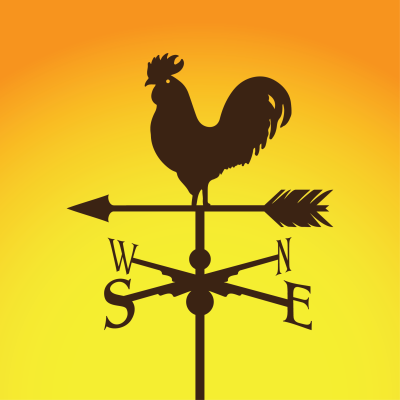 Feel free to share situations where you want to report wind direction using compass points. Can you think of similar cases with evenly spaced data bins where you could use this method? Post your ideas below. How do I write the calculate compass data into a Table? I need to calculate a 30 minute average data from wind sensor e write the compass data from it in a table. I don´t know how to do it. The compass sector, being a string variable, can only be saved to a table with the Sample instruction. The difficulty, in your case is the vector average of the wind must be calculated first. It is possible to read values back out of a data table. However, you can't save that compass sector to the same table. We have worked around limitations before by making a table with just the Windvector. You then read that value back out, and can save it with other data in your main table. GetRecord is the easiest way to read values back out of a table.